People of Umudioka dressed in the specially designed uniform at the Nka Dioka Cultural Festival, Neni, December 2018. On 31 December 2018, the pavilion of the Umudioka Arts and Cultural Centre in Neni, Anambra State, Nigeria was filled by thousands of people who attended the 40th Nka Dioka Cultural Festival of Umudioka, Neni. Ndi Igwe (community leaders), titled men, and state functionaries graced the occasion. A live orchestra, cultural musical troupes (such as Egedege), and masquerades (agbogho mmonwu, otenkwu, etc.) electrified the arena with their performances. The people of Umudioka filed in in groups according to their age grades, all dressed in the same uniform designed exclusively for the occasion. 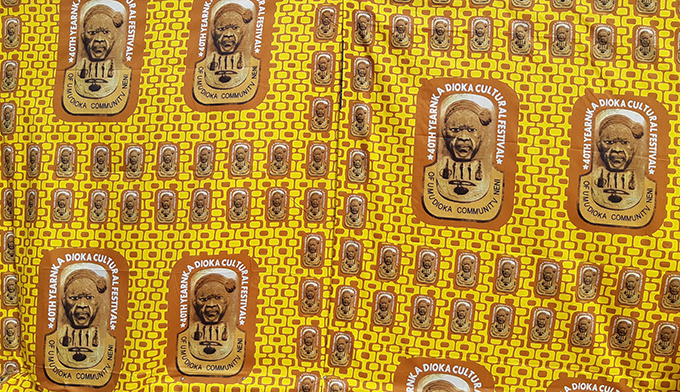 The main motif repeated on this uniform comprised of a man’s face with ichi marks positioned above the tools used for the scarification, framed with the inscription ‘40th Year Nka Dioka Cultural Festival of Umudioka Community Neni’. The motif is a visual articulation of the event, giving insight into the history and culture of this town in Anambra State. Textile design for the 40th anniversary Nka Dioka Cultural Festival. Umudioka communities (in Neni and seven other towns among the Igbo) were historically known as specialist surgeons who carried out ichi and nki facial scarification, mbubu (body marking from neck to belly) and iwa eze (tooth filing). 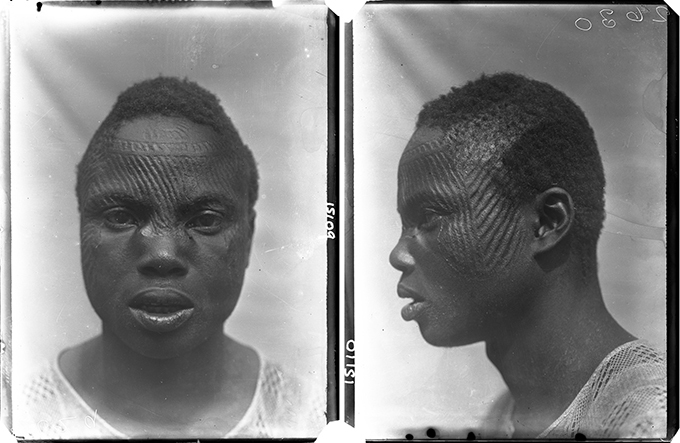 Among the photographs that Northcote Thomas made during his 1910-11 anthropological survey of what was then Awka District (corresponding more or less with present-day Anambra State), there are numerous portraits of people with facial and body scarification. Due to its broad social, political, and economic signification, ichi was the most common of these markings. Ichi specialists from Umudioka were invited to various towns across the region to create the marks on those who wanted them. Their clients were mainly male, although certain women, including priestesses, could also obtain the marks. Thomas wrote about the practice in his Anthropological Report on the Ibo-speaking Peoples of Nigeria. In the case of families of high social and economic status,ichi marks could be obtained for their children at a relatively early age. In adulthood one can also do it as an expression of one’s wealth and prestige. The ichi scarification process begins with a journey by the Nwadioka (ichi specialist from Umudioka) to the Nwa Ichi (his client). The Nwadioka is accompanied by Nwa Nso, an assistant who carries the the Nwadioka’s tool bag and prepares the ground (mat and wooden pillow) on which the Nwa Ichi lies for the marking. He is also accompanied by the Nwa Mgbado Ichi, a second assistant who holds down the Nwa Ichi’s legs on the mat while the scarification is taking place. It is, of course, painful to receive ichi marks; so, to assuage the pain during the procedure, the Nwa Ichi’s mother or wife intermittently gives him a piece of fish to eat. Words of encouragement and melodious songs are also used to soothe the pain. At the same time, the lyrics of the songs convey various messages about ichi, the dexterity and experiences of the Nwadioka, and the value of the art. Nwa Nso plays the role of a nurse for fourteen days, cleaning the cuts with warm water and administering herbs that facilitates the healing. Implements (mma nka) used for ichi scarification. 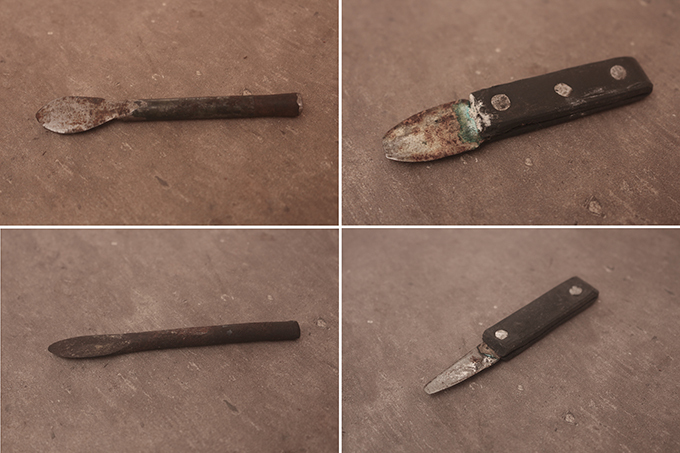 Clockwise from top left: (1) ichi knife for marking the affluent; (2) ichi kninfe for marking less affluent; (3) knife for isu nki (the short strokes on the temples and bridge of the nose); (4) knife used for itu mbubu (body marks for women). Before the incursion of Christian missionary activity, ichi served as a means of protection for those who had the marks. For instance, they were not prone to abduction for slavery which was rampant at that time. The high value placed on ichi also made it a prerequisite for ozo title taking in most Igbo communities. In fact, ichi is seen as a sign of class stratification, not only by virtue of receiving the marks, but by the Nwa Ichi’s ability to ‘hire’ the costly implements used to make the marks. There are two types of ichi knives which do not necessarily produce different results but the use of one attracts higher payment than the other. Thus, there is an ichi knife for the highly affluent and another for the average class. When the Nwadioka completes the ichi cutting, he remits a certain percentage of his pay to the group of retired Nwadioka called Ndi Isimmanka. In the mid-twentieth century, the ichi marking tradition was disrupted by the expansion of Christianity, which held that it was a fetishistic practice. Following the consequential decline, and after much controversy, the ichi tradition was, however, reinvented in Neni in 1978. From then on, ichi marks would no longer be received in the actual sense of cutting the skin, rather it became a symbolic practice performed annually at the Nka Dioka Cultural Festival. We witnessed this reinvented tradition being performed at the 40th anniversary of Nka Dioka in Neni on 31 December 2018. Two men received the symbolic marks that day. Then men were carried on the backs of attendants and laid on mats where the ceremony took place. The marking ceremony was accompanied by the traditional ichi songs and the Nwa Ichi were given fish to eat as in the original ceremony. The marking itself, however, did not involve cutting; rather the ichi knife merely traced the patterns on the men’s foreheads, leaving no visible trace. 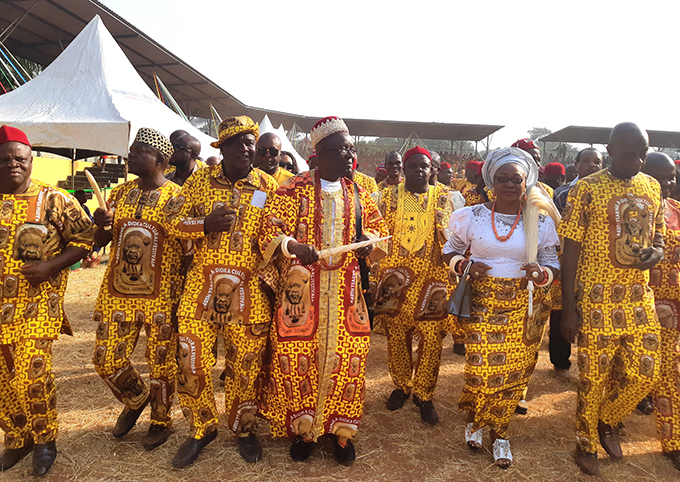 Scenes from the symbolic ichi marking ceremony at the Nka Dioka Cultural Festival, Neni, December 2018. Left: Nwa Ichi being carried on the back of an attendant; right: the symbolic cutting being performed. Northcote Thomas was not the only ethnographer to make a study of ichi scarification among the Igbo people. The anthropologically-minded missionary, George Basden, who spent most of his career working in the Awka/Onitsha area from 1900 to 1926, discussed ichi scarification in his 1921 book Among the Ibos of Nigeria. In particular, Basden noted the important role of Umudioka (which he spelled Umu-di-awka) communities in the practice. He observed that the men of Umudioka ‘hold a sort of monopoly of the profession [of ichi cutting], and travel all over the country for the purpose’; further noting that ‘judging by the number of those bearing the ichi marks, it must be a prosperous business’ (1921: 183). It was, however, a later Government Anthropologist, M. D. W. Jeffreys, who made a more extensive investigation of facial scarification as part of a study of ‘the magico-religious beliefs of the Umundri’. Jeffreys identified two distinct ichi patterns, one associated exclusively with Ndri, another which he termed the ‘Agbaja Pattern’. In his article, ‘The Winged Solar Disk of Ibo Itchi Facial Scarification’, published in 1951, Jeffreys provides a detailed account of ichi from a man named Nwora from Nibo, who was an old man when interviewed in 1930, when he recalled having the ichi operation in his youth. Nwora explained that the Eze Nri had told the Umudioka to cut other towns differently to Nri, and it is forbidden to use the Nri pattern elsewhere. Figures I, II and IV from M. D. W. Jeffreys’ article ‘The Winged Solar Disk of Ibo Itchi Facial Scarification’, published in 1951. Figures I and II show the differences between the Ndri (Nri) and Agbaja ichi patterns. 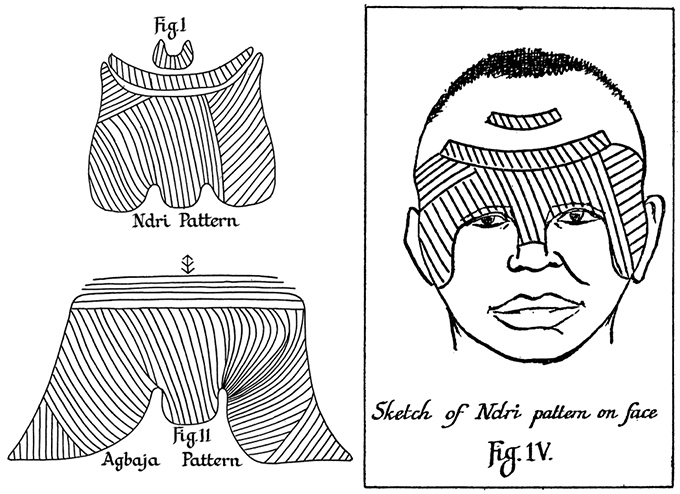 Figure IV shows the Ndri (Nri) pattern as it appears on the face. Compare this with Northcote Thomas’s photograph of Iyiazi taken in Nri in 1911. Ichi patterns were not only cut into people’s forheads. The same patterns are used to decorate a wide range of objects, including wooden door panels, ancestral figures, stools, masks and pottery used for ritual purposes. Thomas photographed many such objects during his survey work, and we have also come across examples in the artefact collections he made, which are cared for by the University of Cambridge Museum of Archaeology and Anthropology. We will be including a section on ichi in the [Re:]Entanglements exhibition in 2020 when we will display some of these objects alongside contemporary artwork by Chijioke Onuora, who is developing a series of batik paintings drawing on ichi motifs documented in Northcote Thomas’s photographs and collections. Ichi patterns carved into objects in the N. W. Thomas collections at the University of Cambridge Museum of Archaeology and Anthropology. 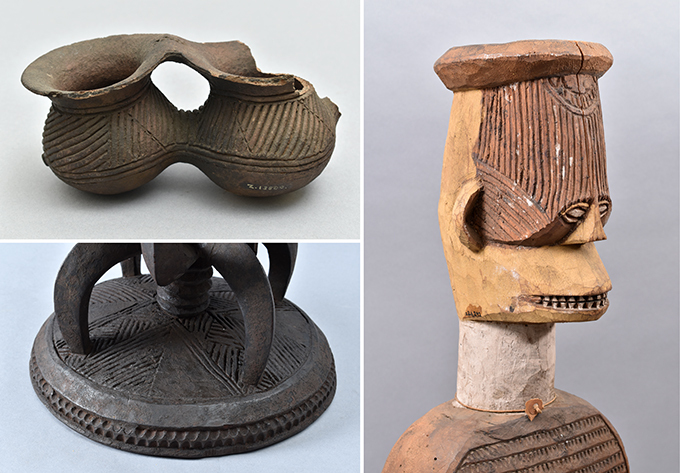 Clockwise from top left: ‘Pot used for giving Ndicie palm wine’ from Nibo (MAA Z 13800); Ngene shrine figure from Nibo (MAA Z 14234); base of wooden ozo title stool from Awgbu (MAA Z 14011). 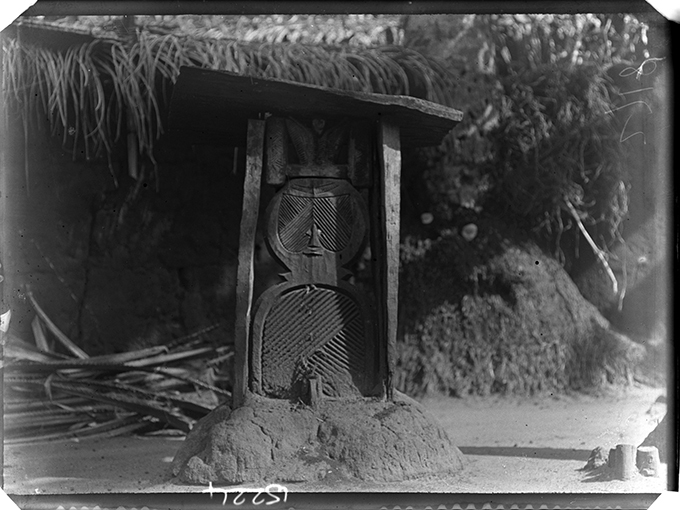 Ichi designs on ‘uwho’ shrine figure at Nri, photographed by Northcote Thomas in 1911. As can be seen in the Nka Dioka Cultural Festival in Neni, ichi is celebrated as an important part of Igbo cultural heritage – especially among Umudioka communities. In this respect it is interesting to note how Chief Odidika Chidolue (also known as Oke Iwe Adimma) is revered by the community as the only surviving man in Neni who has actual ichi marks. As a valued part of Neni’s living heritage, he receives a monthly stipend of 15,000 Naira from the Eyisi Ebuluo Foundation, which supports the preservation of local culture. 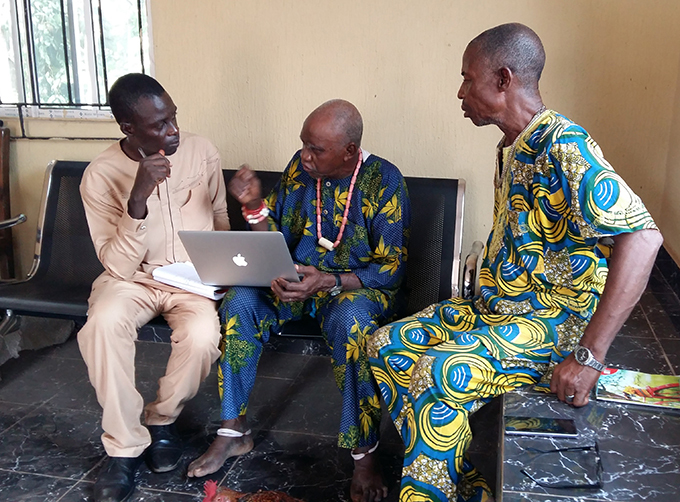 In the course of our fieldwork we had the privilege of talking with Chief Odidika Chidolue as well as Nze R. O. Udeze (Eyisi Ebulue II) and Fidelis Igwilo, and were fortunate in being able to record some of their traditional ichi songs. Video documentation of song traditionally sung during ichi marking. Performed by Chief Odidika Chidolue and Fidelis Igwilo, January 2019. 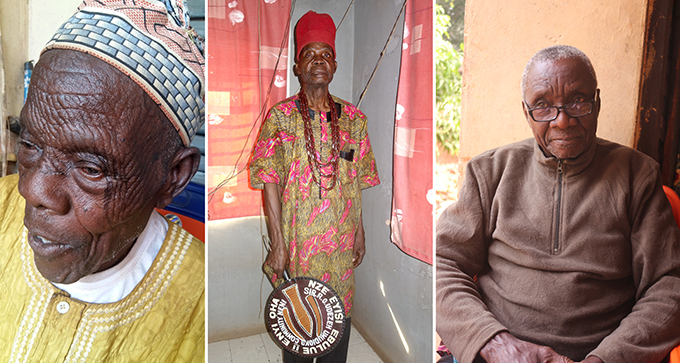 Many thanks to our friends in Neni: Chief Odidika Chidolue (also known as Oke Iwe Adimma, the only surviving member of the community to have ichi scarification marks), Nze R. O. Udeze (Eyisi Ebulue II) and Fidelis Igwilo. We look forward to continuing our research in Neni and, through the [Re:]Entanglements project, exploring other opportunities for documenting this fascinating cultural heritage for the benefit of future generations. Basden, G. T. (1921) Among the Ibos of Nigeria. London: Seeley, Service & Co.
Jeffreys, M. D. W. (1951) ‘The Winged Solar Disk or Ibo Itchi Facial Scarification’, Africa 21(2): 93-111. Thomas, N. W. (1913) Anthropological Report on the Ibo-speaking Peoples of Nigeria, Part I: Law and Custom of the Ibo of the Awka Neighbourhood, S. Nigeria. London: Harrison & Sons. ‘Charms’ collected by Northcote Thomas in Sierra Leone, 1914-15. Clockwise from top left: Sacrifice to keep children well (MAA Z 14477); Charm to protect kola tree (MAA Z 14479); Charm (MAA Z 14499); Charm for kola tree (MAA Z 14502). Sometimes the most potent objects are not the most visually striking. This is true of the various ‘sacrifices’ and ‘charms’ that Northcote Thomas collected in Sierra Leone in 1914-15, and now held by the University of Cambridge Museum of Archaeology and Anthropology. 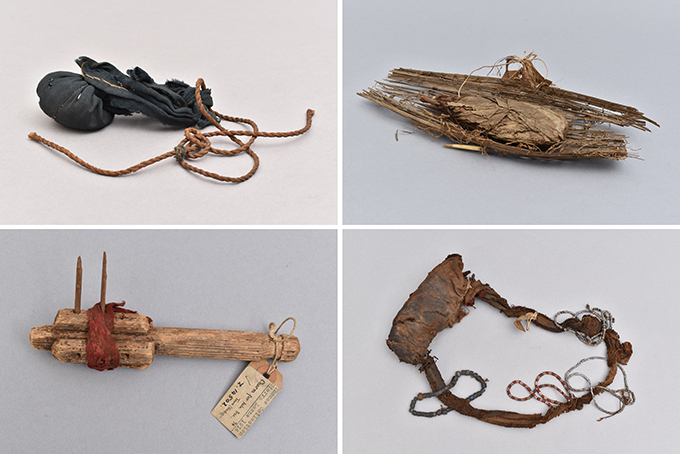 They take many forms – cloth covered bundles, a few sticks tied together, crumbling packages – yet they are also some of the most powerful objects in the Thomas collections. They have the power to protect people and their property from malevolent forces, including witchcraft, which might bring sickness, crop failure or other calamities. Witchcraft and the various means to protect oneself from it appear to have been of particular interest to Thomas during his tour of mainly Temne-, Soso-, Koranko- and Limba-speaking communities in northern Sierra Leone. He devoted a number of chapters of his Anthropological Report on Sierra Leone to the topic and related matters. This reflects the centrality of the issue to the communities he worked with. He evidently struggled to make sense of the numerous rites, ceremonies, sacrifices, amulets and charms that were employed by different communities to protect themselves from malevolent forces. This no doubt reflects the anthropologist’s desire to make distinctions between and classify the practices and objects he encountered. Thus, in Chapter 7 of his Report, Thomas discusses various rituals, sacrifices and magical things under categories of ‘satka’, ‘wanka’ and ‘kanta’, and yet in his descriptions the distinction between these is often blurred and confusing. 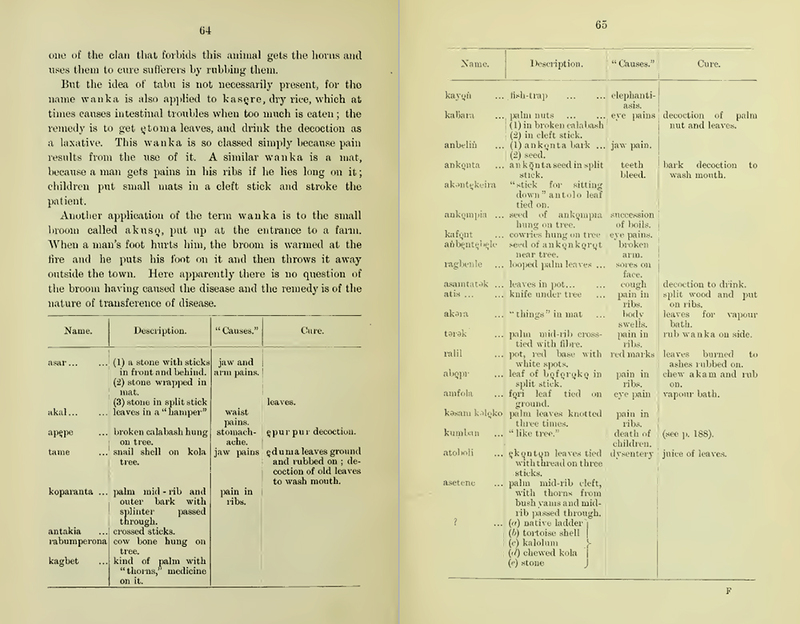 Pages from N. W. Thomas’s Anthropological Report on Sierra Leone, including a table in which Thomas attempts to produce a typology of wanka. The ‘belief’ in witchcraft is still very much part of life in Sierra Leone and it is not unusual to see protective amulets, charms and other devices, especially in rural areas. The need to protect oneself from malevolent forces (the invisible ‘bullets’ of a ‘witchgun’, for example) is strongly felt and local herbalists or ritual specialists perform important roles in their communities. Although these charms are often constructed from ordinary things (basketwork, calabashes, eggs, stones, fishing nets), these have been ritually transformed. Thomas concluded that the objects were often selected because of their mimetic properties – a fragment of old fishing net thus becomes a ritual trap, for instance. ‘Sacrifice against fire’, photographed by Northcote Thomas in Fundembia (? ), 1914. NWT 5735; MAA P.33428. Satka are often set up outside people’s houses. They typically take the form of long poles, on top of which are suspended various things – sometimes a white or red cloth, sometimes a small fan or basket, sometimes a small bell. Thomas observed these too: ‘Chief among mimetic rites’, he wrote, ‘may be mentioned the custom of hanging up a fan which swings in the breeze and is believed to be efficacious in blowing away evil influences’ (Thomas 1916: 53). We were given a similar explanation at the village of Katumpeh, on the road between Kamalo and Kamakwie. 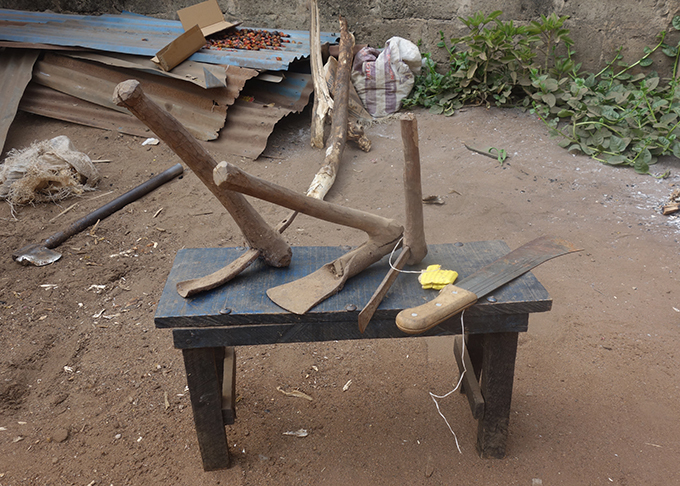 Mr Abraham Dumbuya explained that his previous house was damaged by strong winds, so he had this satka made. Now when evil comes with the wind, it sees the satka and jumps over the house, leaving it unharmed. Instead, the satka welcomes in good luck. 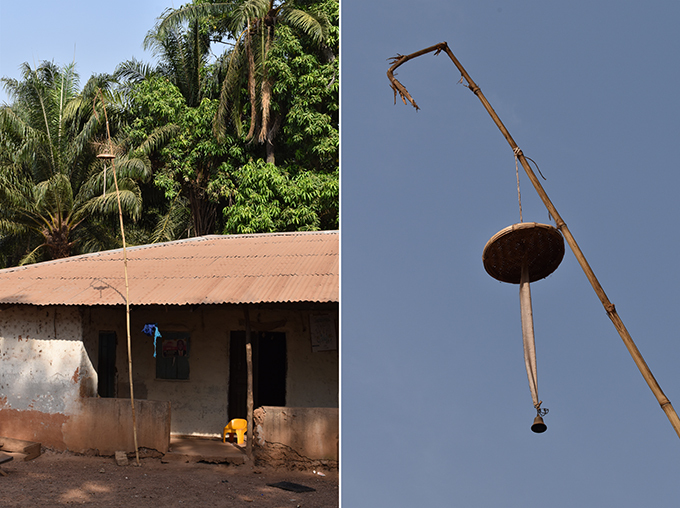 Another man in the same village explained that when his satka swings in the breeze, it will invite good luck to the household. Satka outside house in Katumpeh, on the road between Kamalo and Kamakwie. Photographs by Paul Basu. When we brought copies of Northcote Thomas’s photographs of Mamaka to show the present-day community, we asked about the various wanka he had photographed. One type, in particular, was instantly recognized. Thomas describes this as a type of ‘sacrifice’ ‘put at the entrance to a farm … to keep away witches, bad krifi [spirits], and evil-disposed persons and influences’ (Thomas 1916: 53). 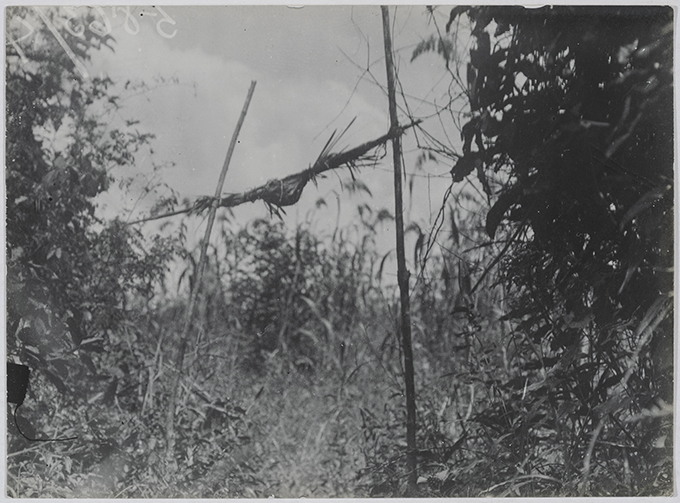 ‘Sacrifice at entrance to farm’, photographed by Northcote Thomas in Mamaka in 1914. NWT 5863; MAA P.33523. In Mamaka, we were later introduced to Mohammed Kamara, a herbalist or omen, who agreed to let us film him making such a charm, which he described as a kantha. He explained that farmers would approach him to make the kantha. It would be set up at the entrance to a farm at the time of hoeing the soil, before planting. The kantha can be re-used from year to year, but a new ceremony must be performed each year. 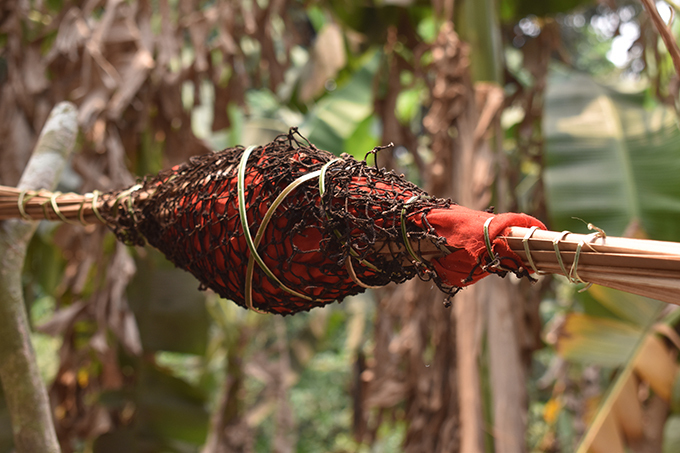 The kantha includes a raw egg wrapped first in a red cloth, then covered in a piece of old fishing net. These have previously been transformed into powerful things using herbs or medicines. These are placed in a basketry receptacle that has been woven into long strips of cane. The receptacle is then covered in another piece of red cloth and another piece of old fishing net, which is bound in place. Just like the example photographed by Northcote Thomas in 1914, this is then suspended on two poles and set up at the entrance of a farm. At key points in the making of the kantha, Mohammed spoke words that ‘activated’ the charm. The egg, he explained, was like a bomb – if a witch passed by, it would explode. The fishing net was a ritual trap. Documentation film of Mohammed Kamara, herbalist, making a kantha charm to protect farm from witchcraft. Mohammed learnt the skills of a herbalist from his father, Pa Almamy Kamara, who had, in turn, learnt the art from his mother, Yanna Kanray. He explained that not everyone has the power to make such charms and cure diseases. One must be gifted with ‘four eyes’ – that is, the ability to engage with the spirit realm. We asked how much a farmer might pay him for a kantha and he explained that it depended on how much he was able to pay. We asked that the kantha Mohammed made for us be given to a poor farmer who could not afford to pay. We hope that it will protect his farm from harm and bring a good harvest! The finished kantha that Mohammed Kamara made for us in Mamaka. Photograph by Paul Basu. George Agbo and Chief Anaemena discuss photographs of wood carvings collected by Northcote Thomas in 1911. 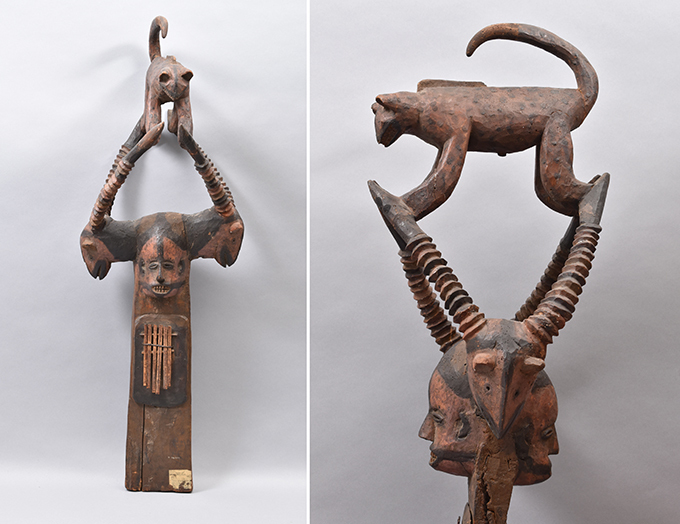 In 2018 we photographed many of the artefacts collected by Northcote Thomas during his anthropological surveys in Nigeria and Sierra Leone and now held at the University of Cambridge Museum of Archaeology and Anthropology. This allowed us glimpse into the artistic skills of the various communities in which Thomas worked. This included metal working such as bronze casting and blacksmithing, wood carving, pottery, basketry, weaving and leather working. Our engagement with these collections has led us to pursue certain lines of inquiry in our fieldwork: for instance, we are interested in who made these objects, why and how they were made, to what uses were they put, and whether these artistic practices have survived. Carver, Felic Ekhator, of Sakpohba Road, Benin City. In some place, such as Benin City, we have found that traditional arts continue to flourish, as can be seen in the metal working guilds in Igun Street or the nearby wood carvers who produce works not dissimilar to those collected by Thomas over 100 years ago. In many places, however, it appears that these skills are being lost or have died out. 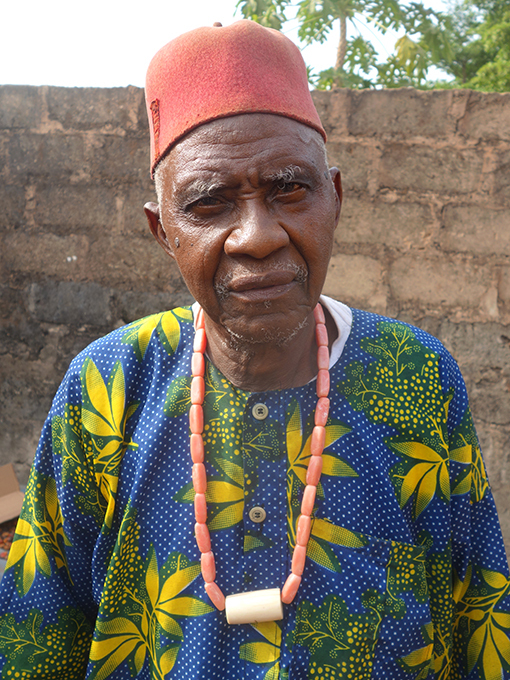 Ozo Chief Raphael Anaemena of Amansea, Anambra State, Nigeria. In Amansea, Anambra State, Nigeria, which Thomas visited in 1911 during his first tour among Igbo-speaking communities, we met a carver – Chief Raphael Anaemena – who also holds the Ozo title. We did not see him work; he is advanced in age and has not carved in a couple of years, but he shared interesting insight into the art. 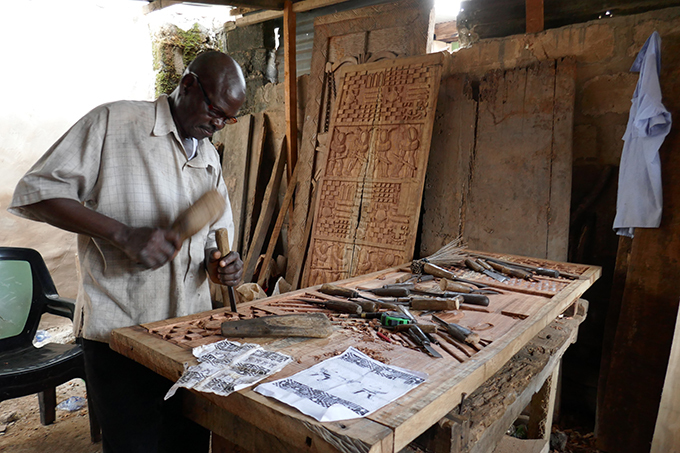 He is from the Ibe family in Amansea, historically known across the region for the art of carving. Although we do not have record of any wooden artefacts collected by Thomas from Amansea, Chief Anaemena’s father or grandfather may well have carved the doors or shrine figures that Thomas photographed in the town. He and other carvers from the Ibe family also received commissions from neighbouring towns such as Ebenebe, Ugwuoba and Awka where Thomas did collect. There were carvers in these places too, but the works of the Ibe of Amansea were particularly sought after due to the high quality of their craftsmanship. Examples of wood carving photographed by Northcote Thomas in Amansea in 1911. 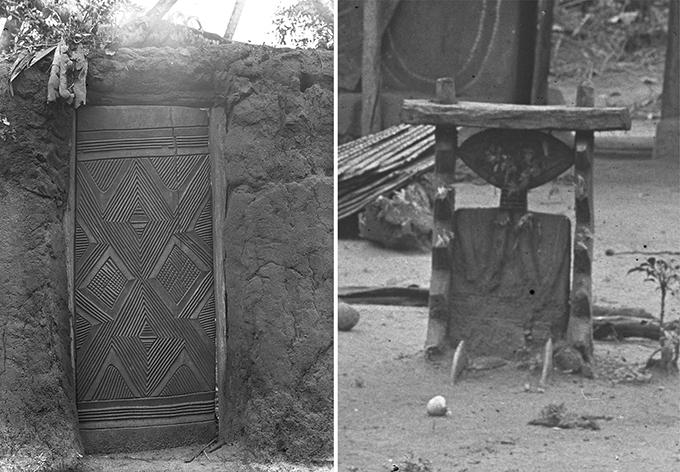 Left: carved door (NWT 3466; RAI 400.20020; MAA P.31638); Right: shrine figure (NWT 3473; RAI 400.20026). We sat down with Chief Anaemena to look over some of the photographs of the wooden objects Thomas collected in the area and benefitted from his insight into production techniques. Consider, for example, how carvers joined pieces of wood. Looking at the above elegant wood carving to which a thumb piano (ubo) is attached, and which was acquired by Thomas in Awgbu, Chief Anaemena explained that some parts such as the leopard and the animal heads with horns were carved separately and then joined together. While other carvers would use glue, such as the type made of wax from a certain insect in the bee family, to join the various parts, the Ibe would achieve a better result by creating a protrusion on one piece of wood and a groove on the other wood into which the protuberance would be fitted. Another joinery technique is ‘nailing’ with thorns such as those from orange trees, palm branches or pieces of wood given nail-like shape. However, this technique only works with soft woods such as the type used in the production of the box for keeping eagle feathers which Thomas collected from Nise. Generally, the kind of wood used for carving is determined by the object the carver intends to create. Masks for instance would be produced from light wood so that they could easily be carried by the masker. Other production specifications such as size and design are largely determined by the one who commissioned the carving. Carvers do not usually produce carvings to be kept for sale. The work is driven by demand, where the carver could even be employed for some time in his client’s home. 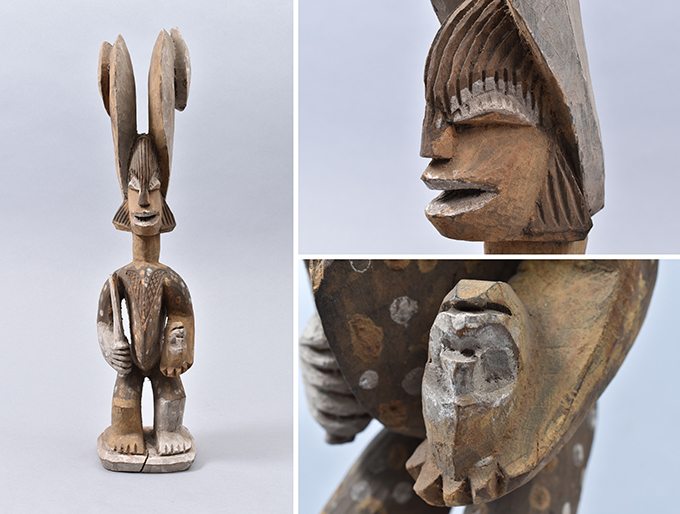 One who wishes to have an ikenga figure made, for example, would give the carver specifications about size and the objects it would carry in its hands. However, clients could at times ask the carver to make design decisions for them. According to Chief Anaemena, it was once common to see the ikenga figure with a knife in one hand and a human head in the other as exemplified by the one Thomas collected from Awgbu. The trophy is suggestive of the malevolent side of ikenga’s power. At some point, people began to find that too fierce. Ozo Chief Anaemena explained that, in the 1970s, he began to put the ofo stick in one of the ikenga’s hands and a knife in the other to suggest ‘okpegbuo ogbuo’ (it can only kill justly). This was well received and it soon became fashionable. Stool carved by Chief Anaemena for his Ozo title taking ceremony, Amansea. Today, Ozo Chief Anaemena does not carve anymore but he still has some of his works. 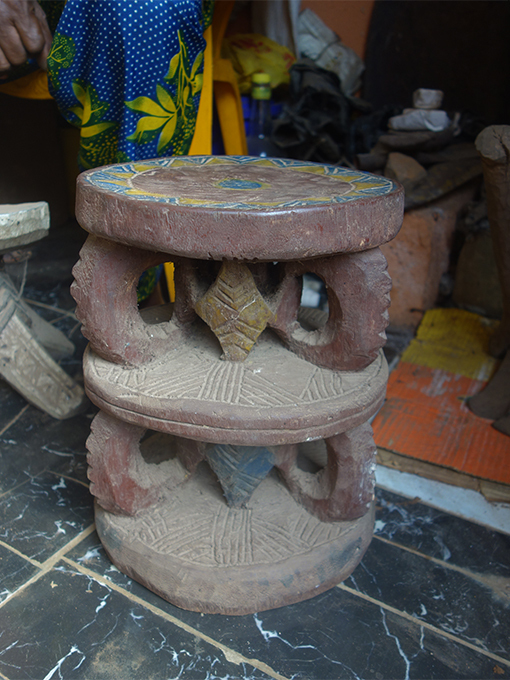 An example is the stool he carved in 2013 for his Ozo title taking ceremony the following year. He also showed us some of his carving tools including nkori oshishi (for creating effects on the wood), muma (for shaping), ugama (for cutting), and mma oge (for cutting). We hope that in the course of our fieldwork we will meet some traditional carvers who still practice their art and look forward to learning more from them. Some of Chief Anaemena’s wood carving tools, including: (1) nkori oshishi (for creating effects on the wood); (2) muma (for shaping); (3) ugama (for cutting); and (4) mma oge (for cutting). 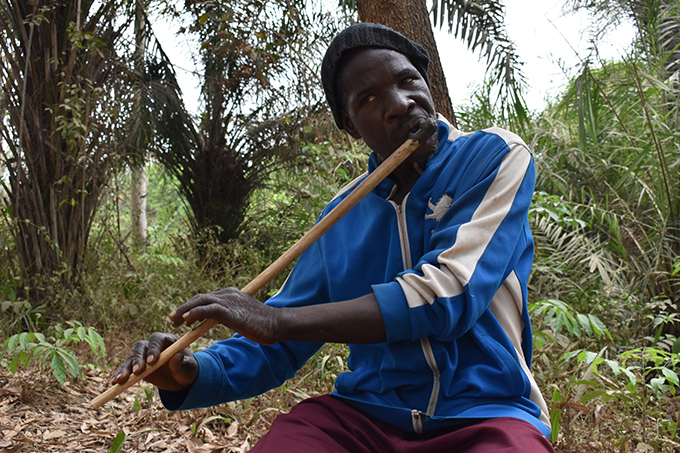 Hassan Jalloh, flute player from Bendugu, Sambaya Chiefdom, Sierra Leone. 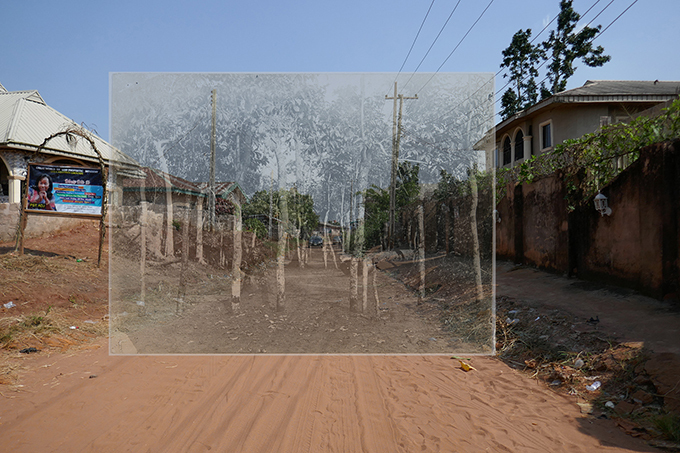 As part of our fieldwork in Sierra Leone, we are recording contemporary musicians and singers in the locations in which Northcote Thomas worked in 1914-15. Indeed, the majority of the wax cylinder phonograph recordings that Thomas made during his Sierra Leonean tour are ethnomusicological. 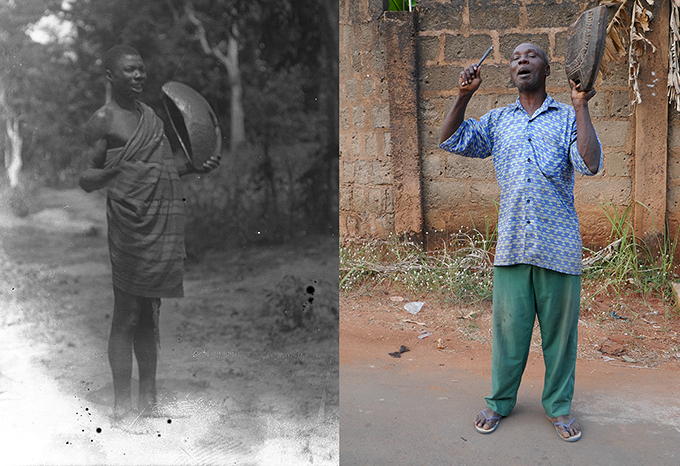 On 21 October 1914, while conducting research in Mabonto in what is now Simera Chiefdom, Tonkolili District, Northern Sierra Leone, Thomas recorded a flute player. Mabonto is now largely Temne-speaking as a result of in-migration due to mining activities. In 1914, however, Mabonto was a Koranko-speaking town. Recording of Koranko flute made by Northcote Thomas in Mabonto on 21 October 1914. NWT 681; British Library C51/3076. When we asked whether there were any traditional flute players in Mabonto, we were told that there were none, and that one would have to go deeper into ‘Koranko country’ in order to find one. We were told about a flute player named Hassan Jalloh, who lived in Bendugu in neighbouring Sambaya Chiefdom. The following day, after a long, arduous drive through the hilly terrain, we arrived at Bendugu only to find that Hassan had been called away to play his flute at a men’s society ceremony. Thankfully, however, we were able to arrange for him to come to Mabonto the day after, where he played for us. We played Hassan Northcote Thomas’s 105-year-old recordings of the flute player in Mabonto. Hassan confirmed that this was the same instrument he played. He immediately recognized the music and began playing a version of the same song, which he told us was played in the men’s society camp. Hassan Jalloh playing a version of the flute music recorded by Northcote Thomas in Mabonto in 1914. Thomas collected two examples of these flutes and they were some of the most fragile objects that we photographed in the University of Cambridge Museum of Archaeology and Anthropology (MAA) stores in 2018. They are made from reeds that grow on river banks in the region. Hassan explained that he learnt to make and play the flute (locally called fuli or fullii) from his father who had learnt from his father before him. 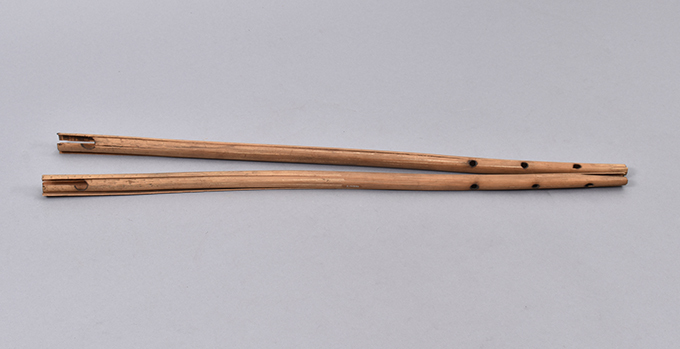 The finger holes are burnt into the reed using a hot stick and one can still see where the stick has singed the reed in the examples in the MAA collection. It appears that the MAA examples were not played, however, since they are missing the mouthpiece, which is fashioned from a kind of resin produced by insects. Reed flutes collected by Northcote Thomas in northeastern Sierra Leone in 1914, now in the collection of the University of Cambridge Museum of Archaeology and Anthropology. NWT 139; MAA Z 14559.1-2. 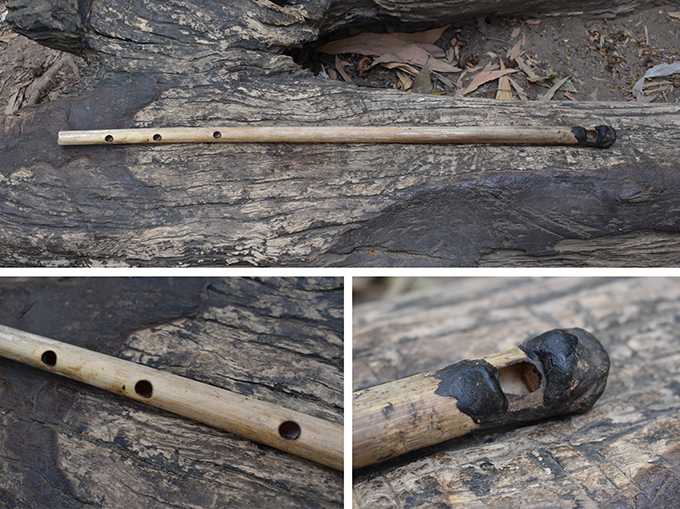 Hassan Jalloh’s flute. Note the mouthpiece formed of resin that is missing from the examples collected by Northcote Thomas. 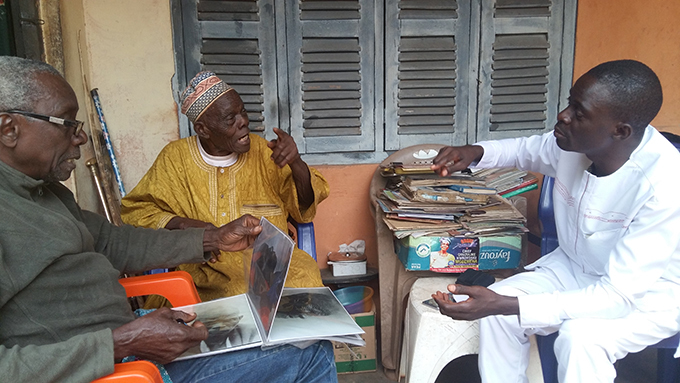 George Agbo (right) interviewing Chiri Izu Igwilo and Odidika Chidolue in Neni, Anambra State, Nigeria. Photograph by Glory Chika-Kanu. Field research in West Africa is an important part of the [Re:]Entanglements project. This research, which will be one of the main activities of the project’s second year, involves retracing parts of the journeys made by Northcote Thomas during his anthropological surveys in Nigeria and Sierra Leone between 1909 and 1915. One of the objective of this fieldwork is to reconnect with the communinties that Thomas visited over 100 years ago, and, where possible, to deposit copies of Thomas’s photographs, sound recordings and other archival materials with the descendants of those he documented. The historical archives and collections provide a medium through which to build relationships in the present. As well as ‘repatriating’ the archive, we are learning a great deal more about its content. The photographs, sound recordings and material culture collections are remarkably well contextualised compared with other ethnographic archives, but still there is much we don’t know. The return of the photographs and sound recordings provide occasions for telling the history of the settlement or community, explaining what is going on in a particular scene, or indeed correcting errors in Thomas’s documentation. 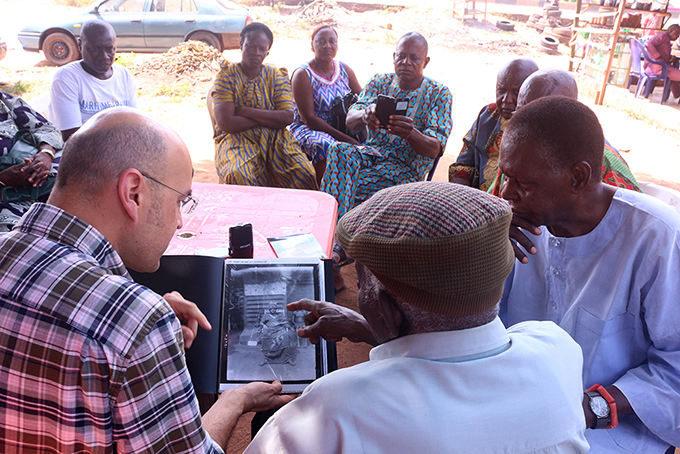 Paul Basu (left) conducting fieldwork with elders, including David Ormoruyi Egonmwan and Ekhaguosa Aisien, at Idunmwowina, Benin City, Edo State, Nigeria. Photograph by George Agbo. In our initial travels with these archives, we have found, of course, that much has changed in the areas in which Thomas worked a century ago. Places that were villages surrounded by forests have become neighbourhoods in conurbations. Thatched, mud-brick houses have been replaced by concrete and glass. Christian churches have often supplanted local shrines and traditional religious practices. And yet the continuities are also striking. Older members of the community still recall the old buildings from their youth; the names of photographed ancestors are known – a family resemblance is detected their descendants’ faces; the sacred grove is still somehow sacred. Iyowa elders, including Mr James Aigbuza and Ambassador Etiuosa Ighodaro, pictured with their respective forebears Agbuza (NWT 1250), Idodaio (NWT 1244) and Odiaisi (NWT 1246). Photographs by Paul Basu. We will post longer accounts of our fieldwork here on the project blog, but please also follow our progress by joining the project Facebook Group, where we post more frequent updates. Ghosts of past landscapes? Idunmwowina on the outskirts of Benin City. While Idunmwowina has changed much in the 110 years since Northcote Thomas visited with his camera, we were able to locate many of the exact locations he photographed. Here, for example, is Thomas’s photograph of the gate that once marked the entrance to the town superimposed on the scene as it appears today. Photographs by N. W. Thomas (NWT 332, RAI 15494) and Paul Basu. Agukwu Nri, Anambra State, Nigeria – Then and Now. Much has changed in the 108 years since N. W. Thomas visited Agukwu Nri, but there are many continuities too. Here, for example, is the Nri town crier of 1911, whose name Thomas recorded as Nriaka, and Edechi Chidokwe, who is the Nri town crier today. The wooden gong they carry is called ekwe ogbo in Igbo, and today they are often inscribed with the name of the owner’s age grade. Photographs by N. W. Thomas (NWT 2671, RAI 15167) and Paul Basu. Eke Market, Agukwu Nri in 1911 and today. Photographs by N. W. Thomas (NWT 2240, RAI 15841) and Paul Basu. 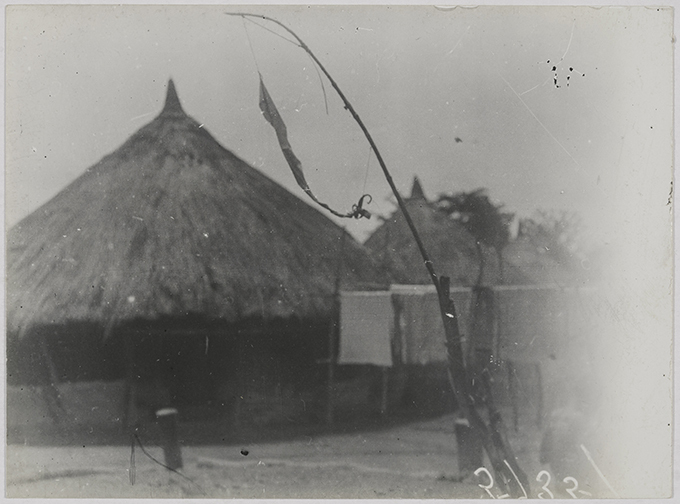 Panoramic photograph made by N. W. Thomas using the Kodak No.1 Panoram camera, Nigeria, 1910-13. Print from the University of Cambridge Museum of Archaeology & Anthropology, P.39431. Northcote Thomas used a number of different cameras during his four anthropological surveys in West Africa between 1909 and 1915. During his first tour, in Edo-speaking areas of Nigeria, his equipment list included a Hunter & Sands Tropical camera and a Goerz camera. 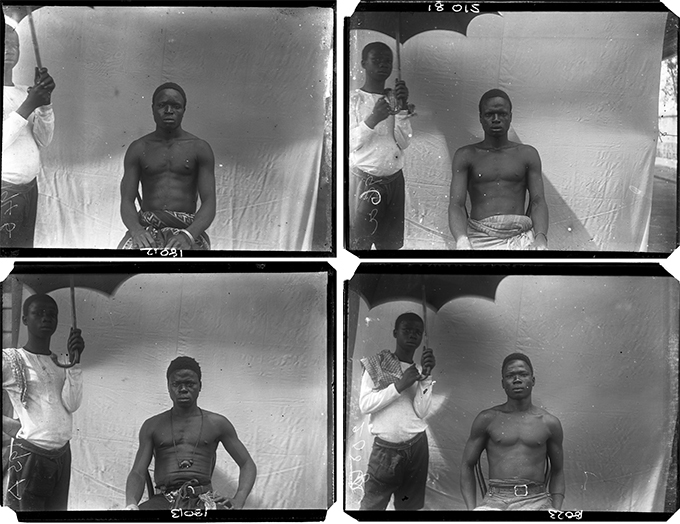 On his three subsequent tours, in Igbo-speaking areas of Nigeria and in Sierra Leone, however, his photographic kit included three cameras: an Adams Videx camera, a Stereoscopic camera, and a Kodak Panoram camera. The majority of Thomas’s photographs were taken on quarter plate glass negatives on the Videx, but it is clear that Thomas experimented with both stereoscopic photography, also using quarter plates, and panoramic shots using the Kodak Panoram, which used 105 format roll film. Through the [Re:]Entanglements project, we have been systematically digitising all of N. W. Thomas’s photographic negatives and prints with our partners at the Royal Anthropological Institute and University of Cambridge Museum of Archaeology & Anthropology. Until recently, we believed that only Thomas’s quarter plate glass negatives and corresponding prints had survived. However, we were excited to discover quite a number of his panoramic prints in the collections in the Museum of Archaeology & Anthropology. On a recent research visit to the National Museum in Lagos, Nigeria, we were also delighted to find a number of these panoramic prints mounted in one of the photograph albums produced during Thomas’s surveys. 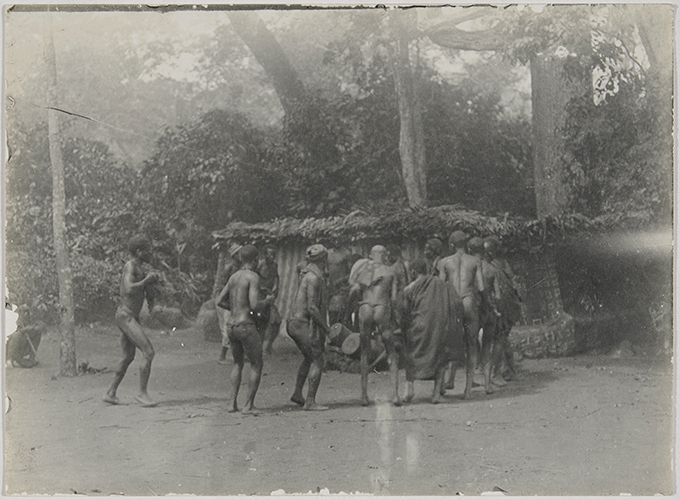 Page of panoramic photographs from one of the albums produced during N. W. Thomas’s anthropological surveys in Southern Nigeria. Originally deposited in the Colonial Secretariat in Lagos, the albums are now in the care of the National Museum, Lagos. The Kodak No.1 Panoram camera, which Thomas used, was manufactured between 1900 and 1926. The camera had a swinging lens, which took 3.5 x 12 inch exposures across a 112 degree arc on 105 film stock. An advertisement of the time asserts that ‘The pictures taken by these instruments have a breadth and beauty not attainable with the ordinary camera. The wide scope of view makes the Panoram excellent for taking landscapes, as it can cover a wide area without the distortion incident to the use of wide angle lenses’. There is an excellent article on the Kodak No.1 Panoram at Mike Eckman Dot Com. Kodak No.1 Panoram camera. The picture on the right shows a close-up of the Panoram’s ‘swing lens’, which turned 120 degrees when the shutter was released. The more we explore Northcote Thomas’s fieldwork photography, the more we learn how innovative he was for the time. 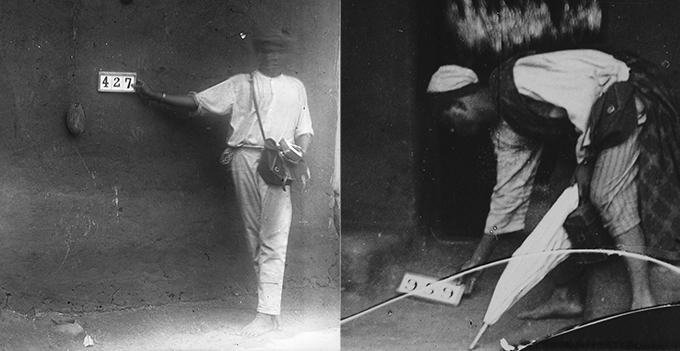 For example, during his 1910-11 tour in what was then Awka District, he experimented with using two cameras simultaneously to photograph a scene from different angles. This technique would, of course, become an important technique in cinematography. (The earliest known example of a two-camera set up in cinema was the 1911 Russian film Defence of Sevastopol.) 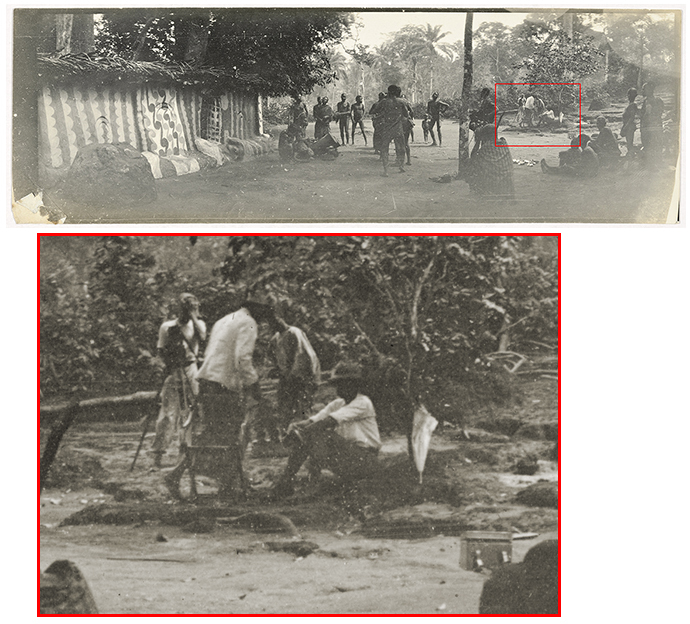 In the example here, we can see that Thomas and his assistants simultaneously photographed what is described as the Ogugu ceremony at Agulu, south of Awka, using both the Adams Videx and Kodak Panoram cameras. Ogugu ceremony, Agulu, Southern Nigeria. Photographed by Northcote Thomas in 1910-11 onto quarter plate glass negative using the Adams Videx camera. Print from the University of Cambridge Museum of Archaeology & Anthropology, P.30566 (NWT 2170). In the resultant sequences of photographs there is a further intrigue, which speaks of the ‘excess’ of the photographic image, and particularly the peripheral presences that creep into the frame without the photographer’s awareness. 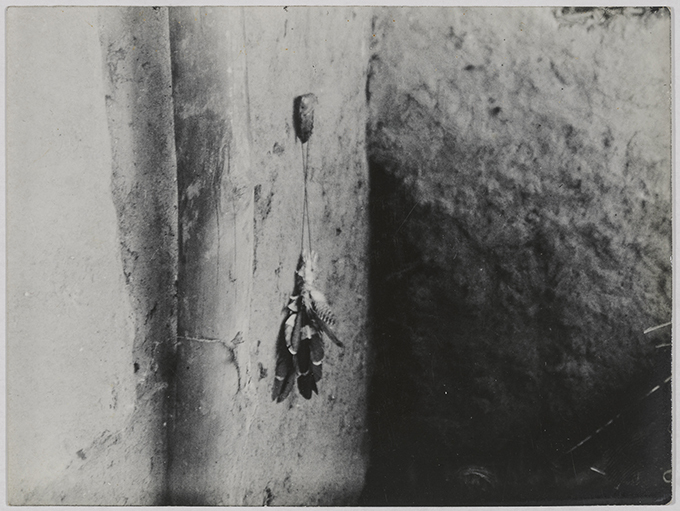 Of over 7,000 photographs in the archive, there are perhaps only three or four that intentionally show something of the process of Thomas’s anthropological survey work. It is only through this photographic excess that we catch glimpses of the endeavor. To date, then, the only photographs we have seen in which we glimpse Northcote Thomas behind the camera are the reverse shots of the Ogugu ceremony at Agulu taken by one of his assistants on the Kodak Panoram. In the background of the panoramic shot we see Thomas stood behind the tripod mopping his brow together with three of his assistants and items of his kit strewn around. A rare insight into anthropologist-photographer at work. Ogugu ceremony, Agulu, Southern Nigeria. ‘Reverse angle’, photographed by one of Thomas’s assistants in 1910-11 using the Kodak Panoram camera. Note Thomas, behind the camera tripod, and assistants caught in the background (see detail). Print from the University of Cambridge Museum of Archaeology & Anthropology, P.39450. One of N. W. Thomas’s assistants, probably John Osakbo, as a peripheral presence at the edge of the frame in a series of physical type portraits photographed in Benin City in 1909. NWT 194b, 195a, 196a, 200a. The image of the anthropologist as a heroic, lone fieldworker, battling through adversity in order to single-handedly document disappearing customs and rituals is a tenacious myth. Some anthropologists intentionally portrayed themselves in such terms. Malinowski‘s 1922 monograph, Argonauts of the Western Pacific, famously begins with the lines: ‘Imagine yourself, suddenly set down surrounded by all your gear, alone on a tropical beach close to a native village, while the launch or dinghy which brought you sails away out of sight’. In fact, we know that anthropological fieldwork is – and always has been – a highly collaborative endeavour. The important role of fieldwork collaborators – including fixers, brokers, assistants, interpreters and other participants – has, however, often gone unacknowledged. A notable exception was Franz Boas, who acknowledged his debt to his Tlingit-speaking assistant, George Hunt, who collected much of the data on which Boas’s publications were based. N. W. Thomas was undoubtedly an energetic fieldworker, travelling extensively in Southern Nigeria and Sierra Leone in the course of some 55-months of anthropological survey work between 1909 and 1915. While Thomas was the sole author of the various reports and publications that resulted from this research, and is credited with assembling the thousands of photographs and sound recordings, and extensive collections of artefacts, botanical specimens and linguistic materials that are the legacy of these surveys, it is clear that this could not be the work of just one man. But who accompanied Thomas on his travels? How many assistants did he have? What roles did they play? One has to look hard to find a trace of such collaborators in the archives of Thomas’s surveys – but they can occasionally be glimpsed as peripheral presences. This peripheral presence is most literally manifest when Thomas’s assistants appear at the edge of the photographic frame, holding a number board, supporting the photographic background sheet, or diffusing the sunlight with an umbrella. Many of Thomas’s photographic negatives are loosely framed, allowing peripheral detail to creep into the picture. The intention would have been to crop these images prior to publication, removing the traces of their co-production. As an experiment, such photographs can be differently cropped, placing the peripheral presences in the centre of the frame. Placing the peripheral presence in the centre of the frame. Again, probably John Osakbo, described by N. W. Thomas as ‘the most capable boy I ever saw’. NWT 427, 959. Represencing Thomas’s fieldwork collaborators also entails recognising their trace elsewhere in the archive. In negative number NWT 261, a photograph of a group of Hausa musicians and dancers taken in Benin City in 1909, an assistant can be seen on the verandah making notes in what appears to be Thomas’s photographic register. These register books survive in the archives of the Royal Anthropological Institute and, indeed, the handwriting on these pages is not Thomas’s. Has the act of writing this very register entry been captured at the periphery of the frame? Left: A group of Hausa musicians and dancers, photographed in Benin City in 1909. Right: Detail showing figure on the verandah at the right edge of the frame, and of the photographic register entry he appears to be writing. NWT 261. Within the photographic archive of the anthropological surveys, there are just five photographs of N. W. Thomas himself. These were likely taken by Thomas’s field assistants. In one intriguing pair of photographs, taken at the same location, it appears that Thomas and one of his assistants – probably Corporal Nimahan (see below) – have taken it in turns to photograph one another. This raises the question as to how many other photographs in the archive might have been taken by Thomas’s assistants rather than by Thomas himself. Left: N. W. Thomas, possibly photographed by Thomas’s interpreter, Corporal Nimahan. Right: Unnamed assistant wearing corporal’s stripes (possibly Corporal Nimahan), probably photographed by N. W. Thomas. RAI 400.38267, 400.38292. There appears to be only one entry in Thomas’s photographic register books in which it is noted that an assistant has taken a photograph. Thus photograph NWT 283 is described as ‘Burial of Legema, 26.3.09’. 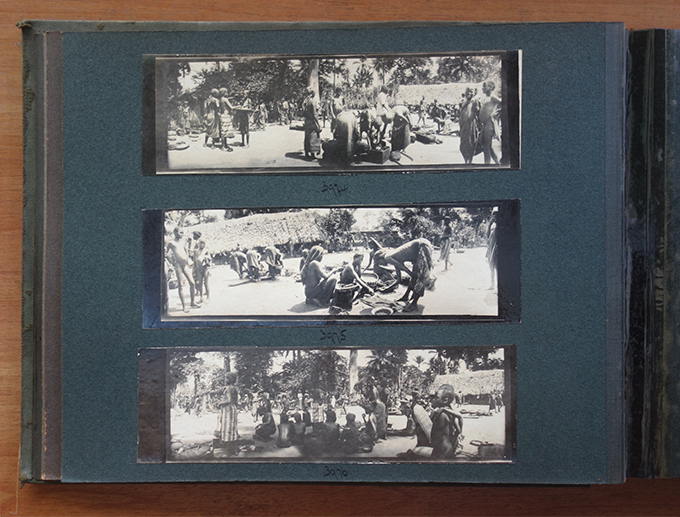 Evidently a sequence of four photographs was taken under this same number: 3 and 4 ‘by N.W.T.’, 5 and 6 ‘by John’. In fact we know a little more about ‘John’ compared with Thomas’s other assistants. This was evidently John Osakbo of Benin City. In a surviving letter from Thomas to the Colonial Office, sent from London in May 1910 after the completion of his first anthropological tour, Thomas requests that this assistant be paid a ‘retaining fee’ of £1 a month until his return to West Africa. Thomas describes John Osakbo as ‘the most capable boy I ever saw’, but notes that he was illiterate, and that the retaining fee should be paid on condition that he learn to read and write, and that he should also ‘receive training in photography’. It appears that Thomas’s request was granted. Thomas also recorded a phonograph of John Osakbo playing a song on a high-pitched woodwind instrument. Thomas’ voice can be heard at the start of the wax cylinder recording (NWT 16; BL C51/2164), ‘…song played by my servant, John, February 10th, 1909’. It is likely that the number of individuals who accompanied N. W. Thomas on his travels varied from tour to tour. He travelled with camp equipment as well as photographic kit, phonograph and much else and would therefore have needed carriers. He seems to have travelled on foot, on bicycle and by hammock. In a letter to the Royal Botanic Gardens, Kew, written in 1928, recalling the collecting of vernacular names of plant species in Sierra Leone, Thomas mentions that Temne and Mende plant names were obtained from his hammock boys, and that they had been recruited in Freetown. Thomas relied on the assistance of interpreters, not only in his day-to-day interactions with people in the communities he visited, but also in compiling vocabularies and other linguistic data. In the preface to Part II of Anthropological Report on the Edo-speaking Peoples of Nigeria, concerned with linguistics, Thomas provides a list of the interpreters with whom he worked during his first tour and explaining the methodology he employed. Their names are: Erumese (Edo/Benin City), Nimahan (Kukuruku and Ishan), Osidora (Agbede and Kukuruku), Ogbedo (Edo/Benin City), James Smart (Sobo), George, Oganna and Isuma (Kukuruku). Nimahan was a corporal of the Southern Nigeria Police, and appears to have acted as both official interpreter and as representative of colonial authority. In Part III of Anthropological Report on Sierra Leone: Timne Grammar and Stories, Thomas notes that the first twelve stories published in the book ‘were recorded from the mouth of various members of my staff’. In conclusion, by attending to their peripheral presences in the archive, it is clear that N. W. Thomas was not a lone fieldwork, but was accompanied and assisted in his anthropological survey work by an entourage of collaborators. While further work needs to be done to identify both the names and full range of activities they undertook, it is evident that their roles were fluid (‘hammock boys’, for example, provided ethnographic and linguistic information and did not simply transport the anthropologist on his itinerations). These collaborators were not peripheral to the anthropological project, but were in fact central to the endeavour. Hopefully, through the [Re:]Entanglements project, we will be able to identify more of N. W. Thomas’s Nigerian and Sierra Leonean collaborators, and correct the erroneous impression that Thomas was single-handedly responsible for assembling this remarkable ethnographic archive.